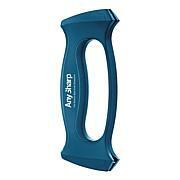 Keep your knives a cut above with AnySharp. Ideal for use with virtually any steel knife, this sharpener hones blades to a 20-degree angle for a perfect edge every time. 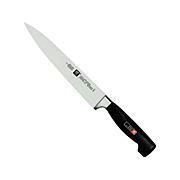 Tungsten carbide technology helps extend the life of your knives, while the polymer guiding top prevents damage to your blades as you work. 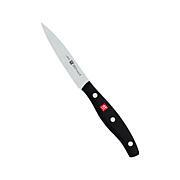 Simply suction it to your counter and draw a blade through for sharpness that slices the competition. I have had several knife sharpeners. I didnt like any of them, until I bought this one. Easy to use and it works. I love this sharpener. I didn't realize how dull my knives were until I sharpened them. They are now "razor sharp". Love the size - small enough to leave on the counter so I don't forget to use! I really love this sharpener! I have needed to sharpen my knives for some time but I dont know how. 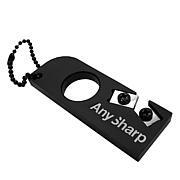 This sharpener is perfect for me! I have been able to sharpen all my knives so easily without messing it up. 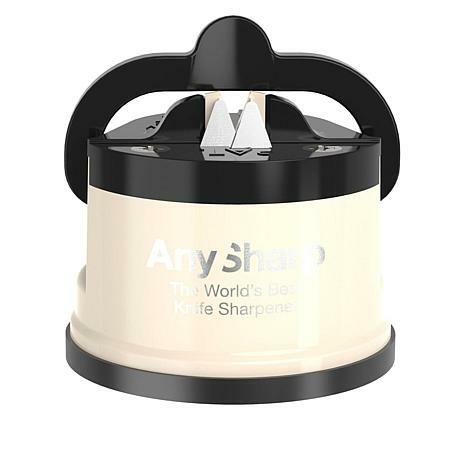 The sharpener is small enough for easy storage, the suction is great for ensuring that it doesnt move while Im using it and its so simple to just pull the knife through to sharpen! 3-4 pulls and youre done! It sharpened my knives so quickly and easily. Im so glad I purchased this.